Maxpedition IRONSTORM Adventure Travel Bag FREE SHIPPING! 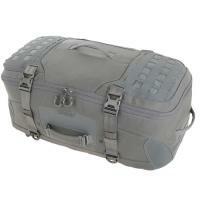 The Maxpedition IRONSTORM is a large and rugged travel bag. It includes three modes of carry for maximum versatility: a sturdy side handle, backpack straps and a shoulder strap with heavy-duty swivel hooks. It is made from a blend of 1000 denier plain weave and 500 denier hex ripstop nylon, allowing it to shrug off wear with ease. External ATLAS webbing makes it easy to attach accessories, so you can use it as the foundation of a modular equipment carry system. The IRONSTORM's large main compartment features internal dividers that can be zipped up and down for convenient organization. It also includes an external padded pocket for a 15 inch laptop or tablet, providing rapid access without having to open the bag. ©2002-2019 CopsPlus.com: Maxpedition IRONSTORM Adventure Travel Bag FREE SHIPPING!